A favorite hunting dog throughout World War I, the Flat-Coated Retriever temperament is playful and friendly. Though they were popular until the end of World War I, their popularity was overshadowed by the Labrador and Golden Retriever. So much so that they were in danger of becoming extinct several times. Luckily for all of us, a dedicated group of Flat-Coated Retriever enthusiasts brought the breed back during the mid-1960s. The Flat-Coated Retriever is still a rare breed today. But thanks to their fan club whose interest and efforts help to preserve the breed we continue to enjoy their intelligence, natural working ability, and demeanor. Flat-Coated Retrievers were initially bred as a “dual-purpose retriever,” meaning they retrieved game on land and in water. Often referred to as the “Peter Pan” of the Retriever group, the Flat-Coated Retriever tends to mature slower than their Sporting Group counterparts. This is a breed that maintains their puppyhood for years. Flat-Coated Retrievers have playful energy that is infectious. They make loyal and entertaining family companions. Friendly and tolerant, the Flat-Coated Retriever adores everyone – including other dogs and children. But, because of their rambunctious nature, they could be too energetic for toddlers. Flat-Coated Retrievers do make great companions for active older children, though. Flat-Coated Retrievers also get along with cats – although some cats aren’t a fan of their constant attention! While they will bark to alert you someone is coming, don’t count on them to do something about it. This breed is far too sweet-natured to make a successful guard dog. For example, the Flat-Coated Retriever will often greet a guest with something in their mouth – a toy, rawhide, shoe, etc. Or, they are bouncing up and down to show their excitement at making a potential new friend. Though they are quite calm indoors, they are still not suited for apartment life. 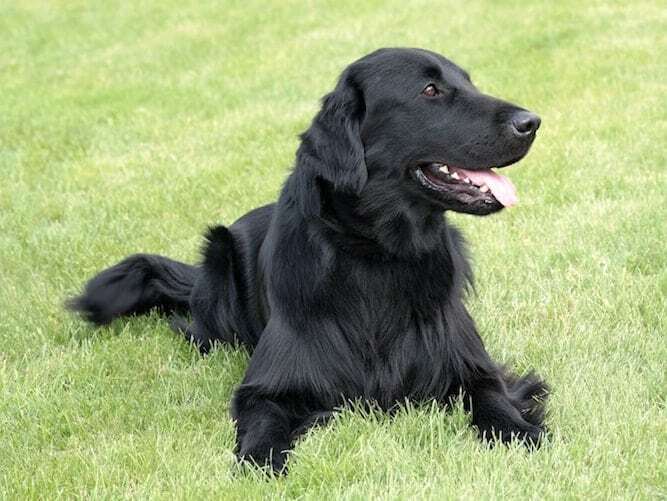 Because of their hunting history, the Flat-Coated Retriever will enjoy a house with a backyard. They will also do well in a home that will utilize their talents: swimming and running. The Flat-Coated Retriever loves to be around their humans and doesn’t like to be left alone. They are attention hogs and if left alone for too long, could be destructive. Flat-Coat’s are also known as food thieves. Be careful of any food on counters or within reach as they will find a way to get it. The Flat-Coat Retriever is both very intelligent and sensitive. Start Flat-Coated Retriever training early as they remain puppylike longer than other breeds. They are very food motivated but will also accept toys as a reward. Though they like praise, Flat-Coats would prefer treats and toys as rewards. Positive reinforcement works best with this breed. Because Flat-Coat’s are sensitive, they don’t respond to harsh training. They will shut down and stop trying. Keep training sessions fun and short, and you’ll have a trained Flat-Coated Retriever in no time. Buying the perfect Flat-Coated Retriever doesn’t have to be overwhelming. Once you decide whether you’d like a Flat-Coated Retriever from a breeder or rescue, it’s time to do your research. Your first stop should be the Flat-Coated Retriever Society of America. Here, you’ll find everything you need to know about the Flat-Coated Retriever breed. They also have information about Flat-Coated Retriever rescues. Flat-Coated Retriever puppies for sale will cost between $1,000 and $1,200. Because the breed is still relatively rare, you may have limited breeder and rescue options. The Flat-Coated Retriever Club (another name for the Flat-Coated Retriever Society of America) has a rescue group, too. They have a section with Flat-Coated Retrievers available for adoption. If you are looking for a Flat-Coated Retriever mix, rescue is your best bet. 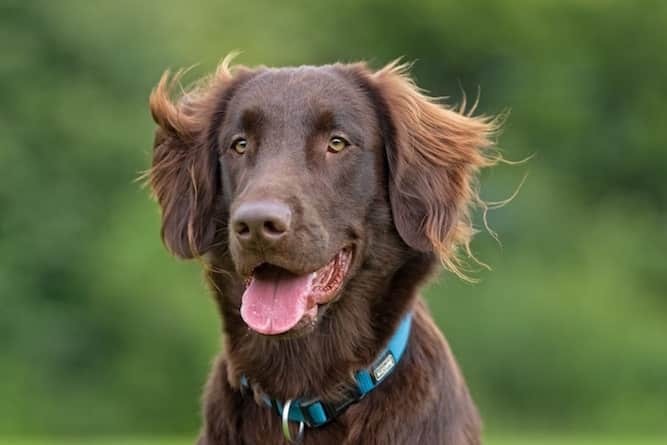 Most rescues or local animal shelters will only have Flat-Coated Retriever mixes available for adoption; this is due to the rarity of the breed. Finding a reputable Flat-Coated breeder doesn’t have to be a headache. Search local breeders and schedule home visits to see how their treat their dogs and puppies. A great breeder to have clean indoor kennels. 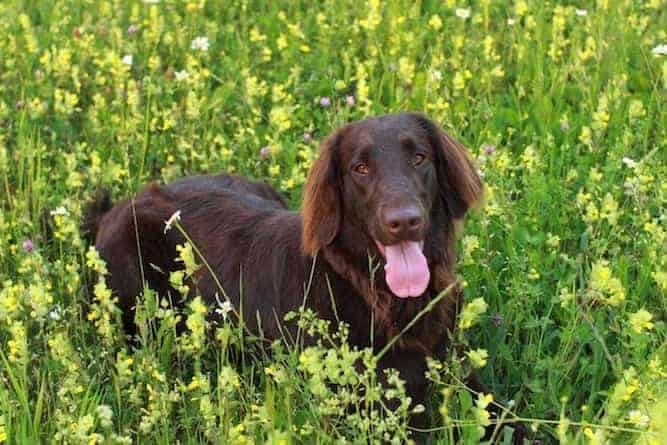 Flat-Coated Retriever breeders should know the ins and outs of the breed – including any health or temperament concerns. Flat-Coated Retrievers puppies from a breeder should come with health certificates and be properly socialized. Steer clear of any breeder that can’t provide health certificates. And, avoid breeders who cannot answer your questions about the breed. So you came up empty-handed in your search for a Flat-Coated Retriever! Well, have no fear. You have many other breed options. These other Sporting Dog breeds have similar temperament traits as the Flat-Coat. The Flat-Coated Retriever comes in sleek black or liver with feathering at the tail and legs. They weigh between 60 and 70 pounds and are between 22 and 24.5 inches tall. The Flat-Coated Retriever lifespan is between 8 to 10 years. The moderately long coat of the Flat-Coated Retriever requires weekly brushing with a metal dog comb. This helps removes loose hair and dirt to keep them looking in tip-top shape. Because of their floppy ears, their ears should be checked regularly and cleaned if necessary. Trim their nails often, too, to avoid any ingrown nails or discomfort walking. Follow These 10 Steps for Outstanding Grooming Results. And several cancers such as Lymphosarcoma (attacks the lymphatic system), Osteosarcoma (Bone Cancer), Malignant Histiocytosis (white blood cells) and Liver Hemangiosarcoma. Must Read: The Ultimate Guide to Dog Health. An excellent resource to help you keep your dog healthy. One of the most active in the Sporting Group, the Flat-Coated Retriever requires a lot (daily) of activity. This is a breed that loves to run, retrieve, and swim. If you have access to a pool or pond, the Flat-Coated Retriever will instantly be your best friend. Swimming is easily one of their favorite activities. Don’t be surprised if you find your Flat-Coat laying in a puddle or running headfirst into the pool. If you don’t have access to a pool, regular runs or long walks will work along with games of fetch in the backyard. 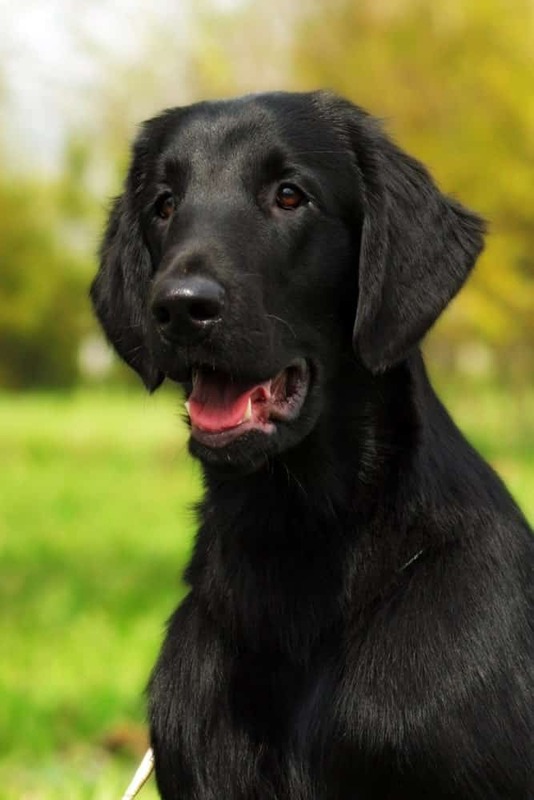 Due to their retrieving background, Flat-Coated Retrievers do well with organized dog sports such as agility, hunt tests, obedience, flyball, or tracking. With their friendly and playful nature, the Flat-Coated Retriever makes an excellent family pet. They get along great with other pets and children. Their lively spirit is infectious, and their “Peter Pan” mentality keeps them young at heart far longer than other members of the Sporting Group. If you’re looking for a companion animal that will also excel at dog sports, the Flat-Coated Retriever is for you.